The organization, which offers behavioral health and education services for children, plans new classrooms and housing for residential students in Chelsea. CHELSEA — Work has begun on a construction project that will expand both classrooms and living space for students at the Chelsea campus of Spurwink, a nationally accredited nonprofit organization that provides behavioral health services and special education for children, adults and families. Eric Meyers, Spurwink’s chief executive officer, said the project has been in the planning stages for a couple of years, and the result is a new three-story residential building with a kitchen, a dining room, staff offices and 16 bedrooms. This new facility means space in an existing building can be converted to classroom space and an indoor recreation space can be added. What’s driving the expansion is the increasing need for services for children, Meyers said, particularly those who have experienced trauma or have intellectual disabilities or autism. Often opiate addiction is viewed as affecting only users, he said, but the ripple effects of addiction reach beyond the individual to their families and children. Meyers said one of the longstanding challenges for behavioral health service providers such as Spurwink is continuing their work when all the costs associated with their programs have increased while, in many cases, the public funding has remained stagnant. “We have to figure out how to be sure we are being as efficient as possible with state dollars,” Meyers said Wednesday. One of the ways to do that is by consolidating facilities. When the project is completed, Spurwink will relocate students living in small residential settings in Augusta, Gardiner and Pittston to the new dormitory on the Chelsea campus. The campus is off Davenport Road, just east of Route 9 in the southwest corner of the town. The school serves both students in residential care and children who live at home and are referred from local school districts. At the same time, organization officials will take the opportunity to upgrade and expand the educational space on campus and add the indoor recreation area in a multi-purpose room. Spurwink also has plans to renovate an existing building into an eight-bed residential building, bringing the residential capacity at the Chelsea campus to 24. The work is expected to be completed by July 1. Earlier this week, Spurwink officials gave a project update to the Chelsea Planning Board, and project team members provided technical details on the availability of handicapped-accessible bathrooms, secure access to the buildings and the layout of facilities and bedrooms in the residential building. One of the results of these moves, Meyers told Planning Board members, is that about 50 more jobs will be added on the campus. “We see the program as we’re envisioning it now as being part of our long-term future in the Chelsea community,” Meyers told the board. As a nonprofit, Spurwink doesn’t pay property taxes, but Meyers said the organization has made payments in lieu of taxes in communities where its facilities are located. 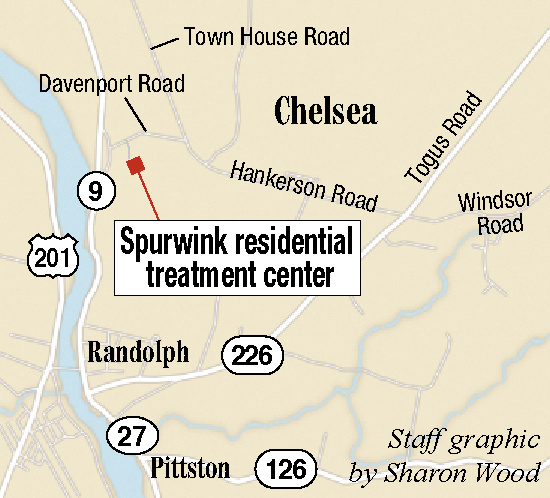 Scott Tilton, Chelsea’s town manager, said Spurwink doesn’t make those payments now in Chelsea. Even so, Tilton said he sees potential benefits to the town, including the possibility that some of those new employees would relocate to Chelsea. That would help the tax base and might help entice businesses, which is a goal of the town’s economic development plans. “It might bring us more volunteers,” he said. The project is not expected to compel any changes to the Chelsea Fire Department’s equipment needs, he said. One floor of the three-story building is below grade, and Chelsea has mutual aid agreements with neighboring communities, including Gardiner, which as a ladder truck. The organization was founded 60 years ago in Portland. It has had a facility in Chelsea for more than 20 years. “We see this as part of our next 60 years,” Meyers said.